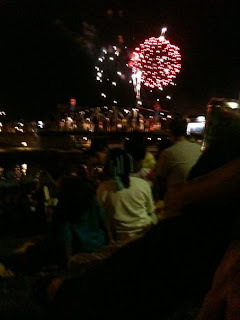 We saw the fireworks downtown by the Erie Canal Slip. Above is a picture Howard took of the event! After that we rode the streetcar back to Big Blue. 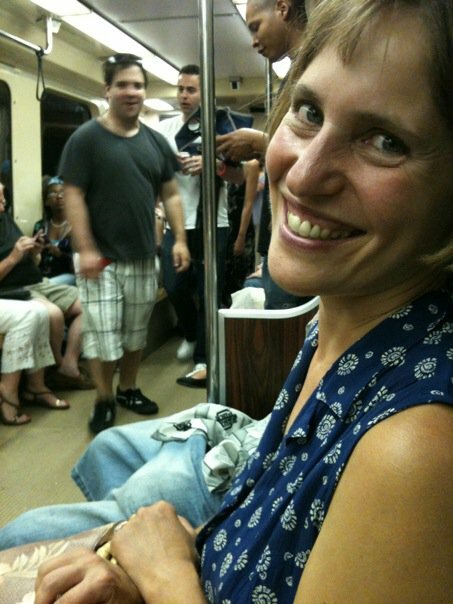 Here is a picture of me on the streetcar. Now you have to look carefully. Look directly to my right and you will see someone else's knees. They belong to this gentleman who was sitting on the train when we got on. Right after we got on the doors burst open and all these other people burst in. They were college-age kids, kind of preppy looking, and they had obviously been partying all day, and a few of them had beers, and they were a riot. These kids began singing, at the tops of their lungs, "God Bless America." It was hilarious. Howard and I and our friend Jane all joined in. After that, to my astonishment, the kids threw themselves into "You're A Grand Old Flag." That is a grand old square song that nobody knows anymore and it was a joy to sing along which, thank to Father Angelo who I told about the other day, I had no problem doing. You cannot imagine "You're A Grand Old Flag" at top volume, sung zestily by a whole diverse crowd of people, all of whom, including us, had had a few. "Sure I've had a few drinks." That is a phrase Howard loves. Of course with him it is never true! So there we are, laughing and singing George M. Cohan, as the streetcar lurches on toward our stop, which was to be Fountain Plaza. Such fun! I thought of the movie where James Cagney plays George M. Cohan and sings that song. We did not sound like Jimmy Cagney of course. We sounded more like this. But what a riot! However. There was one fly in this patriotic ointment. It was the gentleman to my right! He just sat there getting madder and madder. He actually ruined my enjoyment of the singing to a degree because I was afraid to sing for risk of irritating him further. He had his eyes mostly closed and was pretending to be asleep but I knew he was not. At one point he reached into his pocket and I thought: He's got a gun. And I am going to be the first one to go! My life cut short. My book on Leonard Pennario unfinished. Piano scholars all over the world angry and disappointed. We knew she would not finish that book. We knew that project would be abandoned. We knew she was a lightweight. God knows why he trusted her. My dreams, turned to dust! I was honestly nervous. His behavior was weird. Do not get me wrong, no one understands better than I how irritated you can get by loud crowds and noises. But, I mean, what was he doing on this particular streetcar? Everybody's drunk, everybody has come from the fireworks. Luckily our stop approached. We missed it and we had to go on to the next stop, which the crowd loved, chanting "One more stop! One more stop!" But at least we were in the aisle and by the door and I was away from that threatening guy. No wonder they tell you the Fourth of July is the most dangerous holiday. No wonder people drive you crazy by telling you, "Stay safe." There is always one, isn't there? lol Glad you made it OK!